Use this function to create a plane-oriented bounding box (wire or solid) around specific entities that you select. NOTE: When the result of this operation is a thin box (for example, a box of a flat planar profile), a solid box is automatically created with a height equal to two times the coincident distance. The Bounding Box dialog appears. Configure the available dialog options and click OK. Select the solid/sheet body around which you want the bounding box to be created. Select a direction to calculate the box along. Specify whether to compute the bounding box from Solids and Sheet Bodies or Faces of Solids. Specify whether to create the bounding box around the entire list of selected entities, or to create a bounding box around each entity that you select. Specify whether to create the bounding box as a solid or by using lines. When Solid is selected, you can specify a transparency percentage. When checked, a point entity is created at the center position of the bounding box. Checked will create the bounding box in relation to the lower left corner of the active Cplane. Unchecked will prompt for direction to compute bounding box along. 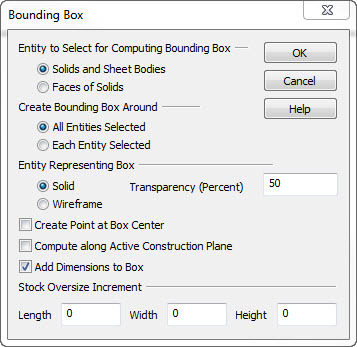 Checked will add X,Y.Z bounding box linear dimensions automatically to bounding box. The dimensions appearance will be guided by settings found in Detail>Settings>Detail Options. Allows for the addition of stock material in excess of exact fit of bounding box.